Dream-Maidens Game Development Blog: First Maidens Avatar Submission to Dream-Maidens! In a recent post, I stated that I didn't receive any submissions from the Maidens Avatar Creator Game. Well on December 27th, 2010 I checked my email and low and behold someone submitted! I was really excited because I thought that no one really cared about emailing and stuff (the email address I gave is really my email address. I don't spam, but I will always respond). I decided that when I got enough submissions, I would create a page on the website that would show them. Since I have only one at the moment, I'll post them in the blog. But fret not, I will add a page to the site in the near future (like very soon). Thanks so much Heather for submitting your creation! 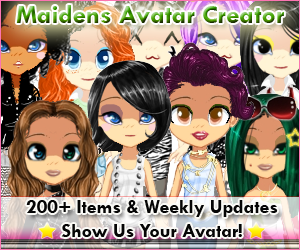 So if you've saved your character from the Maidens Avatar Creator game on the computer, please email it to dreammaidensmail@gmail.com! i sent u an email with 47 avatars on it!!!!!!!!!!!!!!! !